Is your child telling you that handwriting is dead and that computers are the way of the future? Since the digital era began, we’ve been hearing about the demise of handwriting. While there’s no doubt that digital technology is having an impact on the way kids learn, recent research suggests the things that parents and teachers say about handwriting aren’t all wrong. Did you know that new studies have shown that handwriting helps kids learn more and is more effective in helping children to retain the information they’ve been taught? The Wall Street Journal recently cited research conducted at Princeton University and the University of California that showed that students who hand-write notes during class usually retain the information they’ve learned better than those who type on a keyboard. At the heart of this research is the science behind the way your child’s mind learns and the role handwriting plays in helping them to remember and express ideas. It might sound too complex for kids, but this science has many implications for the approach we need to take as we teach handwriting to the next generation. The original intention for typing on laptops was to speed up the note-taking process. While your young techno-wizz might firmly believe that fast is best, one thing he or she might not realise is that taking notes this way doesn’t make information stick in the mind for very long. Recent studies have shown that, 24 hours after attending class, many children who type their class-notes on a keyboard have forgotten that content. It’s interesting evidence that proves that your child’s mind is a complex thing. When children learn, we want them to retain information. Increasingly, studies are showing that typing on a keyboard isn’t always the best way to achieve this. The true value of handwriting notes during class is that fact that handwriting causes your child to think more intensely about what they’re writing about. In many of the above experiments, even though students wrote fewer words when writing by hand, they were forced them to think about the subject matter more intellectually than if they had typed. This changes the old notion that taking notes word for word is going to help your child learn more. By extrapolating information and summarising ideas as they write things down by hand, kids actually force their minds to understand the content they are being taught. This is good for their learning. In the past, handwriting lessons were frequently taught merely to make children’s workbooks look pretty. Today, teachers know that writing legibly and quickly is essential for their students’ enhanced learning. It’s important for your child to learn how to write legibly, not only so they can comprehend what they’ve written, but also so that the person who reads and marks their work can understand what they have learned. Occupational Therapists are university educated in the science of handwriting. They understand the mechanics of posture and pencil grip, and they know that other factors such as visual discrimination also play a part in how children learn to write. There is a ‘window’ in which handwriting help is most effective, and that is when children are aged under 9. When children are young, it is easier to build skills and correct handwriting habits than when they are older. Occupational Therapists can often remediate problem handwriting when children are in primary school, however, by the time child has reached high school, an OT is more likely to work on compensatory strategies because embedded habits are harder to break. 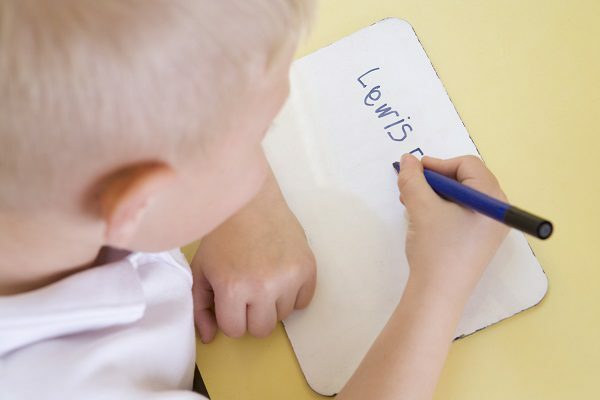 Evidence suggests that early intervention is the most effective approach to resolving handwriting issues and giving children the best chance to learn, remember and express their ideas in writing. Does your child need help with handwriting? We understand that learning how to write by hand improves kids’ educational results and so we make the process of improving children’s handwriting fun and engaging. ← Does my child have autism?